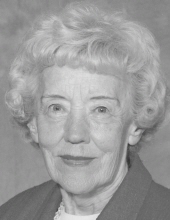 Hope Cooper Caplinger, 96, a resident of Colonial Place in Elkins, West Virginia departed this life on April 3, 2019. She was born March 4, 1923, in Junior, Barbour County, West Virginia. Hope was the daughter of the late Charles and Alice Dumire Cooper. She was a 1940 graduate of Belington High School and attended Davis and Elkins College. On December 14, 1943, she married Fred L. Caplinger in Elkins, WV while he was home on leave from the U.S. Navy. Together, they enjoyed many years of traveling, especially trips with the Tygart’s Valley Shrine Club and the Osiris Shrine Temple. In 2013, they celebrated 70 years of marriage. Hope was a former employee of Watring’s Garage, Cook Insurance Agency, and Fletcher Insurance Agency. She was a member of Davis Memorial Presbyterian Church, The Presbyterian Women, and the Randolph Chapter # 74, Order of Eastern Star. She was preceded in death by her husband, Fred L. Caplinger, of Elkins in 2014. Hope is survived by a son, Jeffrey L. Caplinger and wife, Lisa, of Charleston, South Carolina. She is also survived by three grandchildren, Greyson, Sydney and Emily Caplinger, three step-grandchildren, Brandon, Aaron and Stephan Tenney and a special foster grandson Zaiden. She was preceded in death by three brothers and nine sisters. Hope was a loving mother and grandmother and will be missed by all who knew her. The family will receive friends at Lohr & Barb Funeral Home of Elkins on Monday, April 8, from 4-7 pm. On Monday, at 7 PM, at the funeral home, the Randolph Chapter # 74, Order of the Eastern Star will conduct ritualistic services. On Tuesday, April 9 at 10am, a celebration of life service will be conducted by the Reverend Peter A. Vial and internment will follow at the Maplewood Cemetery in Elkins, WV. The family requests that expressions of sympathy be in the form of contributions to the Davis Memorial Presbyterian Church, 450 Randolph Avenue, Elkins, WV 26241. To send flowers or a remembrance gift to the family of Hope Cooper Caplinger, please visit our Tribute Store. "Email Address" would like to share the life celebration of Hope Cooper Caplinger. Click on the "link" to go to share a favorite memory or leave a condolence message for the family.